In 2016, to raise awareness about the role of a caregiver and about the women and men who are caregivers, Wink Stratégies was asked by l’Appui to design a campaign, to be unveiled in October during the National Caregiver Week. In coherence with the communication axes established in the 2016-2018 plan, we devised a web documentary concept, featuring testimonials from caregivers and professionals who discuss their background and role. The goal was to raise awareness among the general public about the resources available to caregivers and increase the notoriety of l’Appui. The emotional component makes it easy to relate to the cause and thus communicate information in a more natural way. 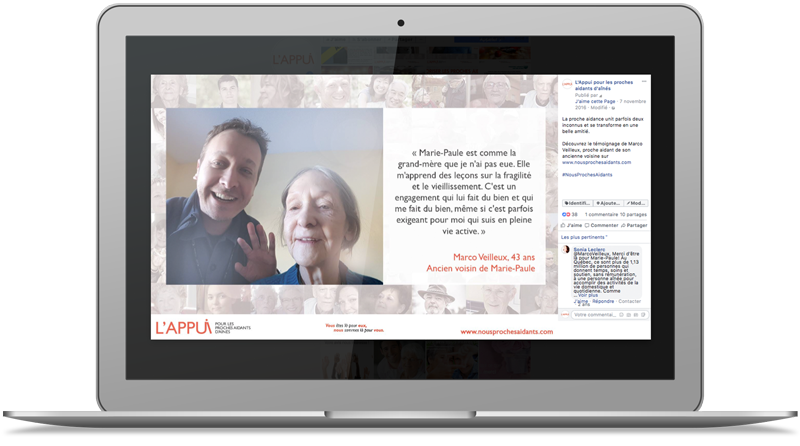 The participative aspect is at the heart of the project: the caregivers are invited to share their testimonials to paint the picture of caregiving in Quebec. With a tight deadline, the “Nous, proches aidants” campaign was launched in time for the National Caregiver Week in October 2016. – On social media, through community management with content about the campaign, but also through advertising. On Facebook, nearly 3.5 million people were reached, and more than 35,000 commitments (like, comment or sharing). – On television, with a regional broadcast of spots from the web documentary’s testimonials web documentary. – Through public relations, both with the press and by setting up collaborations with influencers who relayed the campaign.